Rapini is a green vegetable that is sometimes called Italian broccoli. It has a long stem with small buds and small, thin leaves, and originated in the Mediterranean. You can eat all parts of rapini, although the stems usually take longer to cook than the rest of the plant. The rapini leaves have a slightly bitter taste, while the stems and buds offer a more delicate flavor. Rapini is a suitable addition to several different dishes. 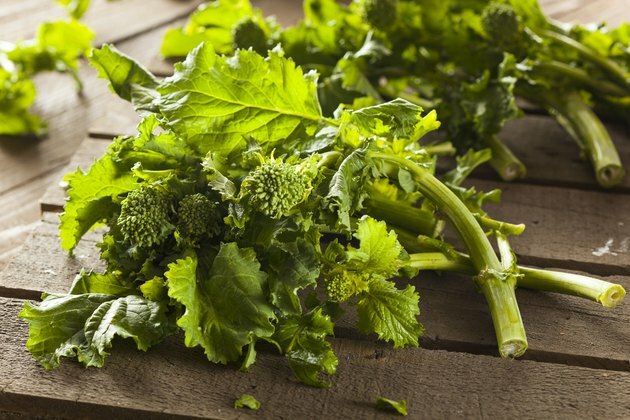 Select rapini that is slender and firm to the touch, with a bright green color and not many opened buds. Trim off the bottom ¼-inch of the rapini stem with a sharp knife. Remove the stems from the leaves and buds with your knife. Bring a pot of water to a boil and add the stems to the water. Allow them to cook for about six minutes, until tender but still with texture. Add the rapini leaves and buds with about two to three minutes left in the cooking time. Remove the rapini from the pot and serve as a side dish or cut up and add to pasta, rice, omelets, mashed potatoes or quiche. To keep the rapini whole, lean it against the sides of your pot with just the stems in the water to cook them first, then dunk the leaves in when it is time.